Computer animation is a necessary component for many growing industries, especially in film and advertising. As this field continues to grow, more international students are choosing a career in computer animation. Domestic and international students alike can find a program that is perfect for them, from small liberal arts schools to large public universities, all across the US. Courses in computer animation are exciting, and the breadth of material enables students to learn to use the latest technology of the field and to develop with it. Have you ever seen a movie or played a video game and wondered how the lighting was so perfect or how the special effects were generated? Chances are that someone who studied computer animation took part in creating what you saw. Computer animation is the use of a computer or set of computers to give life to a series of images. Computer animation is a component in all kinds of media, from the colors you see in television commercials to the explosion scenes in summer blockbusters. Some careers in computer animation include cartoon, film, and video game animation, as well as the animation of websites and advertisements. Because this field is necessary for several growing industries such as video game production and web design, more and more international students are choosing to study and pursue a career in computer animation. Among the top programs, two of the best programs are at Carnegie Mellon University	, in New York, and the California Institute of the Arts, in Valencia, California. Other great programs are found at larger universities as well, such as University of Southern California	or University of Central Florida. Whether you are looking for a school with a small or large student body, or anywhere in between, there is a school with a program in computer animation for you. One question frequently asked by international students is what are the minimum entrance requirements in order to study computer animation in the US? While this answer will depend on the school, students will need to submit standardized test scores and high school transcripts along with letters of recommendations from teachers or employers. 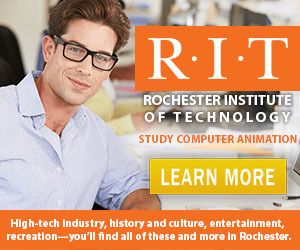 In addition, though not typically required, any background in art or computer animation will give a student an advantage in the admissions process. Those students who are looking to advance their degree in computer animation also have the opportunity to pursue MS and PhD degrees. Although these higher level degrees are not necessary for many jobs in the field, they do provide students with more experience and the opportunity to use the latest tools in the field - and at the same time can equip one to teach courses on these topics in higher education. Not all courses in computer animation involve computers. In addition to the general education requirements of most schools in the US, many computer animation programs involve foundational classes on art, design, and drawing. The combination of these skills enables international students to become well-rounded, equipped with the experience necessary for developing with new technology. Many upper level courses in computer animation also include modeling, rigging, software technology, visual effects, and animation production. Many programs include courses that inform students on how to prepare their portfolios, a useful skill that prepares students for applying for jobs in the field. The number and diversity of jobs available to those who study computer animation is vast. Some of the positions include art directors, storyboard artists, animators, software publishers, and special effects artists. These positions can be found all over the world in all kinds of environments. One popular way to use skills gained by studying computer animation is to get experience — whether you are in Hollywood working to create movies that millions of people will see or if you are working as a character animator on the newest video game. A degree in computer animation offers students flexibility to choose a career in television, film, video games — students can find themselves editing commercials, designing and creating websites, and producing video games. When a student studies computer animation, there are endless opportunities available ready for students to explore!